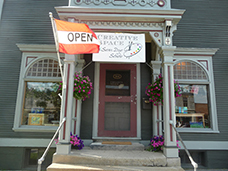 A non-profit co-op gallery of Vermont artists and artisans. We are glad to open for you if we can! Never Felt Better, on view Feb. 23 through April 8, 2018. Winter Painting Class with Sean Dye, Fridays 1-3pm. Feb. 16, March 2, 16, 30. Wet Felting with Nancy Hayden, Saturday March 3, Adults 9:30 to noon; Parent/Child 1:30-4pm. Special Exhibition "Never Felt Better"
to the purchase of a work of art. Give someone you love a gift that will last a lifetime!